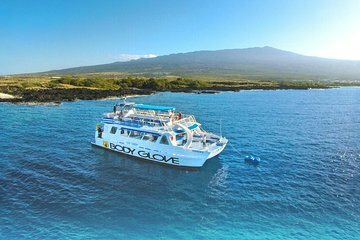 Ontdek het onderwaterparadijs van Kona op deze 4,5 uur durende snorkelcruise en dolfijnenhorloge. Vaar over de beschermde zeedierenreservaten van Red Hill, de thuishaven van meer dan 600 soorten betoverende oceaandieren. Na een veiligheidsbriefing en wat basisinstructie van de door de badmeester opgeleide bemanning spring je in het water voor een snorkel. Geniet ook van dolfijnen kijken en een barbecue-lunch in Hawaïstijl. Ontspan daarna met een cocktail in de premium cashbar en geniet op de terugreis van de tijdloze schoonheid van de kustlijn van Kona. Breng een handdoek mee. Al het andere is inbegrepen. Great boat, great crew. Equipment was in good shape. Reef was in good condition, but not anything special. Did see a ton of spinner and even some bottle nose dolphins. They swam along side the boat for much of the ride to the snorkeling spot. Lunch was good - grilled the burgers right on the ship. Had a great time. I would rate this a 3. My family and I booked this boat thinking we would be swimming with or seeing dolphins since the title is Snorkel Dolphin Adventure aboard Luxury Catamaran. Not the case. We did not see a single dolphin much less swim with them. We were driven out about an hour away and tied down in a cove to snorkel for about 2 hours. We understand that there are times that you may not see a dolphin since they are wild animals, but they didn't even look for them. As we left the dock it was announced, Keep an eye out, you may see a dolphin. They usually hang out here at this time of the day. Then the boat proceeded to speed off. That was it as far as the dolphins went. In the cove we saw fish and coral. The boat was very clean and staff very nice. The boat did provide snorkel gear along with rafts, paddle boards and noodles for everyone to use. Jeremy one of the crew was watchful of everyone snorkeling and keeping them safe. The bartender was also very friendly and trying to engage with everyone. Lunch was nice. Burgers, fruit and chips. On a side note, the previous day we were on a different boat Hang Loose and had a better time. Much smaller boat, staff there was just as friendly, priced about 60 less per person and we were able to swim with dolphins and a manta ray. Great trip ! Beautiful day! Saw many fish and a turtle. Crew were very friendly! Overall, very nice time out at sea - very comfortable boat, convenient for the proposed activities, very nice, welcoming and chatting staff with excellent skills to present the activities. On the slightly minus side: perhaps not an ideal site for snorkeling with rather deep water and limited visible fish life - meaning, we have seen better places -, and the close dolphin encounter was rather limited and at a distance - we saw more going out paddling and kayaking just out the pier. Perhaps just a question of the day!